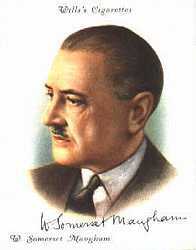 William Somerset Maugham was an English novelist, playwriter but also short story writer. At his era, he was very reputedly and among the most popular writers but not only. Indeed, he was the highest paid author during the 1930s ! In MABEL's W.Somerset Maugham, the narrator was at Pagan in Burma. Whereas it's the night, this one just before to leave to Mundalay ( " a couple of days before I got there " ) stop in a plesant little Club. In this club, he met a man who named George : he was tall / thin/ bronzed with a big moustache/ a khaki short and a khaki shirt. Together, they discussed ( We don't know his name ). More later, another man is arrived . Although, they didn't know, they began to speak. The unknown's friend questionned the narrator about his wife Mabel. From my point of view, this part introduce and allow at readers to discover the plot of story. - What is their situation = The narrator is engaged to marry Mabel. After that, Mabel's father died. Then, the war began and the narrator left at war. As a consequence, the two lovers was separated - during seven years. When, George came back of the war, he is intimidated because he hadn't seen Mabel for seven years...That's why, he decided to shun and to escape Mabel. Indeed, he was afraid of getting married : he sent her a letter and took the boat. George will travel all around the world. At the end, Mabel found George. This one, accept to married. He loves her. Nothing has changed in the fact they eventually get marry however George has understood that he really love Mabel. At the beginning love was linked to difficulties. You can't escape your problems, by travelling all around the world. You must face your your problems for solve them. Anticipation stage: Georges think travelling, it's the best way to avoid marry Mabel =" She was a total stranger ". Drean stage: When Georges is to Singapore, he thinks he'll be safe. Frustation stage: He realizes he can't escape Mabel. She knows always where he is. Nightmare stage: When she stepped outn she has found him. George was petrified. Thrilling escape and return: Back to step me, they've get married.